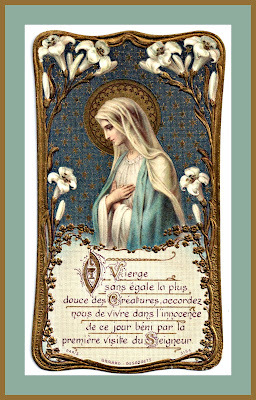 "You, Mary, are God's best creation. blessed by the first visit of the Lord." This is such a beautiful card, and the text is equally beautiful. How fortunate that we are, that Jesus gave us such a Beautiful and Holy Mother. If only I had a teny tiny amount of the faith she had. May each of us learn to imitate her example and say, "yes" to God in Everything as she so perfectly did! Dear Mother Mary, please hold my hand tightly, never letting go until you have seen me home to Heaven! There may my heart join with yours and those of the Angels singing of the tender Mercies and Joys that come from you Son! Jesus and Mary, you are the Joy of the human heart! A Blessed Weekend to all! Keep Warm Micki! John K.
diddleylmaz - Just as she is. Lioness - Welcome. I'm glad you "stumbled" here also. John K. - TY for your "mini-homily".....I love it.